T’was the night before college and all through the house, no one was sleeping especially not my spouse. Momma in her PJs and I with our cat, just couldn’t believe this is where we were at. As I wrote last November, I have been a Certified Financial Planner™ practitioner for almost 20 years now, and have helped a multitude of clients with the daunting task of getting their children through college. Now, I’ve taken that same journey and just sent my oldest son, Jack, off to college yesterday. As my dear dad used to say, “How do you eat an elephant? One bite at a time.” Well, over the past year, we took many small bites of that big ole elephant with the final bite being consumed as we departed campus and left our son in his college dorm room. Once Jack had committed to the college of his choice, it was time to schedule an “orientation trip” where he would take placement tests and meet with an advisor to schedule classes and lock down housing and meal plans. Jack was able to take the placement test online prior to even stepping foot on campus and his advisor did a great job of enrolling him in his required classes. As I mentioned, Jack waited until the May 1st deadline to accept his enrollment and found himself without housing for the upcoming school year. Like our cat, Jack landed on his feet and a room in the newest dorm became available while he was at orientation, so he found a home. Now that classes and housing had been selected, the college could prepare Jack’s first tuition/room/board invoice. Things were humming along. Now it was time to “pay the piper’ as they say. Do you remember when your sweet baby was born and you decided to put some money away on a monthly basis for college someday way off in the future? Well for me, that future day was yesterday. As I mentioned, I have helped many clients set up, fund, and then access their 529 education plans to pay for tuition, computers, etc. (Google “qualified 529 expenses” to see a full list of allowable expenses as it has been expanded). Now it is my turn to withdraw funds from Jack’s 529 Plan, so I log into the CollegeAdvantage website and look for the distribution instructions. There are a couple ways to pay your child’s tuition; payment directly to the college from CollegeAdvantage or the indirect payment option. I opted for the indirect option which means the 529 funds are deposited into my personal checking account and from there I pay the school. I prefer this method as I feel more in control of when the money is distributed, and I would receive an email receipt from the college indicating that the tuition payment was accepted. It worked perfectly, and the 529 funds hit my checking account three days later. I then opted for the college’s electronic check payment method and avoided the expensive 3% debit/credit card fee. I neglected to mention, besides using our 529 Plan, my son assumed an “unsubsidized federal student loan”. For freshman year, the maximum loan amount is $5,500 which is divided into two distributions of $2,750 spread over the two semesters. The federal government uses your FAFSA results to determine if you are eligible for a “Subsidized” or “Unsubsidized” loan. If you receive a Subsidized loan, the government pays the interest charges on your loan while the student is in college; if you have an Unsubsidized loan the student is responsible for the interest that accrues. It has been recommended that if you have an Unsubsidized student loan, you should make monthly payments of the accrued interest which will reduce the amount of your final loan amount upon graduation. If you don’t pay the interest while in school, the accrued interest will be added to the principal balance and then you will be paying interest on the interest you accrued which is less than ideal. By the way, Jack accepted the student loan in early August and we wondered when the funds would be released to the school. I emailed the college bursar and they indicated that the student loan funds would hit Jack’s account 10 days prior to the start of the semester, and like clockwork the funds posted to Jack’s account on the morning of the 10th day before school. Now Jack has some “skin” in the college game. The BIG day arrived, time to move Jack to college. We loaded up the family SUV with all the supplies a college student would need. Upon arrival at Jack’s dorm, a flurry of volunteer students descended upon us and in less than 10 minutes all of Jack’s possessions were safely in his new dorm room, including the dresser I used when I was in college during the 80’s. Now our son is truly on his own! As my wife and I were walking out of Jack’s dorm, I could see her breathe a sigh of relief knowing that our family, like many others, overcame high hurdles to get to this point. Hard to believe we “ate the whole elephant”. Did I mention we have three more elephants to eat? I mean children to send off to college! P.S. 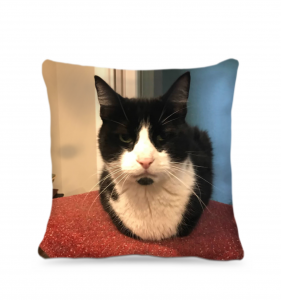 – Jack will miss our beloved cat while away at school so my wife made this pillow of our “legless” cat for him.